Ten minutes into the boat ride toward Dyer Island, across the schizophrenic waters off Gansbaai where the Atlantic and Indian Oceans collide, I realized the most menacing creature encountered while shark cage diving isn’t below the water, it’s above it. Dozens of seagulls fluttered and squawked as their droppings smacked down like a hailstorm. You’re gonna need a broader hat. Shark cage diving is one of South Africa’s most popular activities for travelers. Known as South Africa’s unofficial cage diving epicenter, the infamous “Shark Alley” stretch off the coast of Gansbaai, about two hours southeast of Cape Town. Shark Alley became world-renowned due to its recurring role on Discovery Channel’s annual Shark Week extravaganza — which recently celebrated its 30th anniversary this summer — and a big reason why cage diving sits alongside safaris on most travelers’ South African bucket lists. Fallows is one of the key players in the cage diving industry that serves in excess of 100,000 people each year within South Africa. He is the first person to ever photograph breaching great whites and the creative force behind Air Jaws: Sharks of South Africa, the high-flying 2001 documentary that aired during Shark Week and introduced the world to the acrobatic predators. Fallows’ Apex Shark Expeditions handles 2,000 clients each year and emphasizes a small (12 clients maximum per boat), personalized approach to cage diving as travelers look to live out a Shark Week-esque experience. Apex is one of a dozen cage diving operators in the Cape Town area. Depending on the operator, cage diving costs between $130 — $200 for a half-day excursion and includes transportation to Gansbaai from Cape Town. I dove with Sharklady Adventures, one of the original cage diving operators founded in 1992 by Kim “Sharklady” MacLean who is known for her pioneering research and conservation involving the great white. In the #MeToo era, a female-owned and operated charter may appeal to a number of travelers as much as the opportunity to dive in the cage. Shark sightings are not guaranteed and breaching sharks are incredibly rare, but I saw at least 10 great whites swim, bite the dummy seal, and attack the chum bait during my 20 minutes in the water. 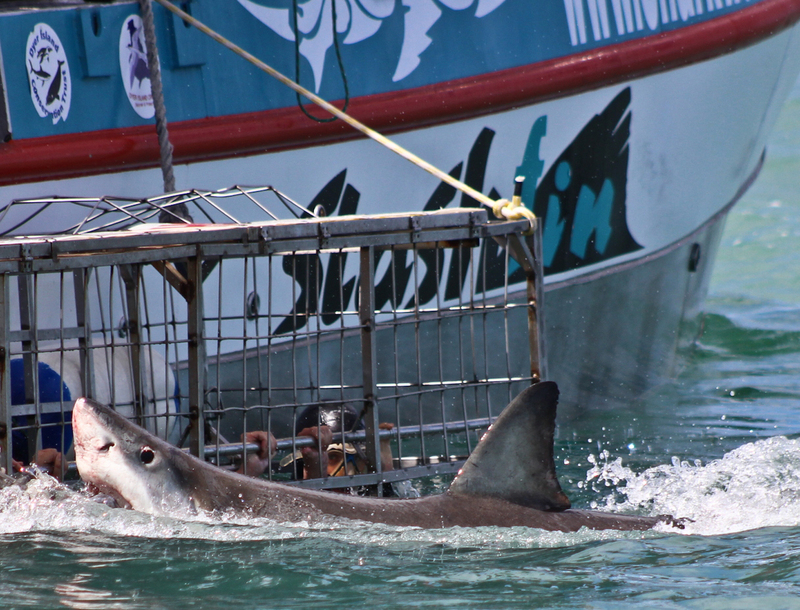 The sharks came within inches of the cage and a few thrashed up against it. The cage had a bottom bar to stabilize your feet and a middle bar for your hands so they remain inside at all times. Sharklady boasts a 100% safety record and I was not about to drop it to 99% by sticking my finger between the bars to touch a shark. Great whites are chaotic yet beautiful in their attacks and this primal force is best appreciated from underwater. The only drawback of my cage diving experience was seasickness. The haphazard sea, fish smell and unpredictable boat movement caused me to contribute to the chum stream off the port side of the boat. I took Dramamine prior to departing and it did nothing for me. Other travelers, particularly those who have experience on the ocean, may not suffer as much as I did, but seasickness is so common most charters post tips for combatting it on their website (Apex Shark Expeditions politely notes: “just make yourselves as comfortable as possible by opening buttons or belts.”). My recommendation: seasickness, if it hits, will pass. Do not let the temporary discomfort stop you from a once-in-a-lifetime experience. As with many forms of wildlife tourism, shark cage diving is not without its detractors. Cage diving has been criticized for desensitizing sharks and conditioning them to associate humans with food. This criticism, according to cage diving operators, is as misplaced as an exploding scuba tank in a shark’s mouth. In short: don’t be scared to hit the Muizenberg or Camps Bay beaches when you return to Cape Town. Conservation-minded travelers will also appreciate cage diving in Gansbaai. The cage diving industry, according to Towner, is one of the best ways to protect sharks from poachers and acts as an unofficial security force against overfishing and hunters. Cage diving is the big draw in Gansbaai but the town and surrounding area offer activities for those preferring to stay on land. The Fynbos Trail, a few miles north of the town, provides lush hiking trails that are not as strenuous as Table Mountain or Devil’s Peak and the Lomond Wine Estate offers 11 different wines from one of the southern-most vineyards on the African continent. Gansbaai is a much smaller town and less wealthy than some of the other towns in the Western Cape, but it offers a number of pleasing activities that won’t bite your budget. 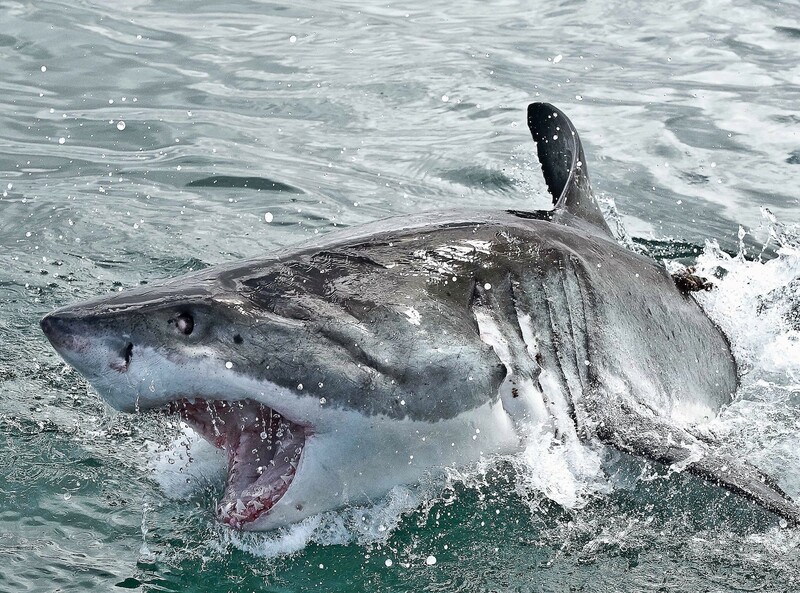 But just as one goes to Paris for the art or Las Vegas for the gambling, sharks are the reason you visit Gansbaai. 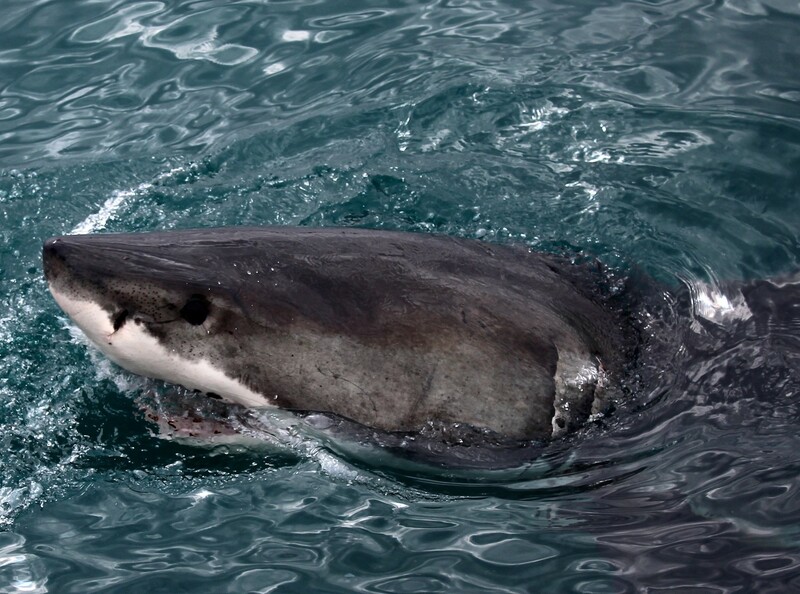 Along with the southern right whale, another recurring Gansbaai resident, the great white is part of South Africa’s “Big Five” ocean creatures, and if you go cage diving between March and September there is a good chance you will see more than five great whites. Book a charter, grab a waterproof camera and live out Shark Week in a half-day at sea. Kyle Gillis is a freelance writer and communications professional from Sterling Heights, Michigan. He’s covered a variety of topics in his journalism career and his work has appeared in the Wall Street Journal, Las Vegas Review-Journal, Washington Examiner and Nevada Journal, among other publications. His first novel, No Worries, is available for purchase on Amazon and other booksellers.